One of the best secrets is hidden away deep in Colombia’s forests. You might be thinking it’s the beans for a new label of Juan Valdez coffee, but it’s a bit more interesting than that: The International Center for Tropical Agriculture (CIAT) based in Valle de Cauca and staffed by an international team of three hundred scientists focused on a growing concern: world hunger. The organization actually belongs to a food-research consortium called Cgiar, which has been contracted by the United Nations to safeguard staple crops – namely cassava, rice and beans, all of which provide basic nutrients in the vast majority of diets throughout the world. So what do we find inside? CIAT contains a gene bank, where instead of money, shelves are crammed with a variety of beans – all different colors, shapes and sizes – like the laid out ingredients of a soup that contains over 36,000 different varieties, stored in an air conditioned vault. To Belgian scientist Daniel Debouck, who comes off as something like a modern day Gregor Mendel, it’s his life work. Already, climate change has led to a number of crop failures throughout the world, and many more are expected to occur, as the next century may see an unprecedented increase in temperatures, over 3°C temperature rise over the next century (that’s a raise by about 5.4 degrees Fahrenheit.) Fortunately, Debouck’s gene bank already has the plant that can withstand these extreme temperatures. While it is little known, the CIAT foundation has had a number of successes going back to its establishment in 1967. The beans developed from CIAT’s earliest experiments have been successful in feeding up to 30 million people throughout Africa, whose extreme climates such as the sub-Saharan region, may see the greatest devastation. Central America has also been greatly devastated from climate change, partially due to the world economy and deforestation, and were the beans to be grown there – it could make a substantial improvement in the quality of life. Throughout the developing world, the UN estimates that over 400 million people rely on beans as a central part of their diets. In Rwanda alone, people consume 132 pounds of legumes every year, which are a primary source of their protein. CIAT’s team of scientists were pushed to action after having read one of the latest reports by Intergovernmental Panel on Climate Change (IPCC) which project that temperatures will increase between 2°C to 5°C over the course of the next century. In response, CIAT created a digital model of vegetable plots in order to see how well they would grow with the spiked temperatures. The results were rather horrifying to witness. By the year 2050, the effects of climate change could reduce arable lands by as much as 50%. Steve Beebe, who heads CIAT’s bean breeding program, was shocked into action by the results and so he began searching through their gene bank for a variety of beans grown in warmer climates, ones that required minimal water and withstood harsh temperatures. “Even if they can only handle a three-degree rise, that would still limit the land lost to climate change to about 5%,” according to Beebe. He tested over a thousand different samples, before finally finding the right one: the tepary bean, which was cultivated in the New World well before the arrival of Columbus, in portions of what is now northern Mexico and Arizona. 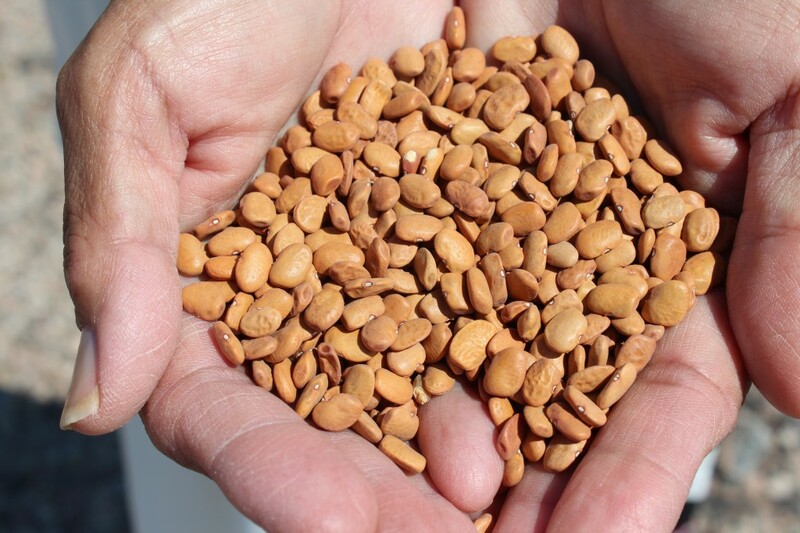 In order to preserve the heat resistant traits o the bean, Beebe tried cross variation with more commonly known beans: pintos as well as, white, black and kidney beans. The new cross-breeds were planted by him and his team in plots throughout Colombia’s humid coast overlooking the Caribbean Sea. For a more accurate read on how much heat their new crossbreeds could tolerate, they grew another plot in CIAT’s greenhouses, allowing them to control the climate. The results gave everyone a pleasant surprise. While some of these cross variations were able to withstand rises of 3°C, others showed tolerance against temperatures that were above 4°C. Now, not only do they have a variety that can make use of land where climate change is already bringing about crop failures, but also one that can avert potential famines in the near future. “Even if they can only handle a three-degree rise, that would still limit the land lost to climate change to about 5%”, said Beebe. The CIAT was founded during a time that scientists suspected the world’s food sources were depleting – a reaction to the rapidly climbing population levels. However, their fears were not completely unwarranted. Both India and China had withstood droughts, destroying their harvests of wheat and rice. The American biologist Norman Borlaug led a team of scientists to develop a new, modified crop variety – giving India not only enough of a domestic supply but also plenty of room for a surplus that allowed them to trade with local countries. Borlaug won the Nobel Prize for his effort, which led to Asia becoming an expanding economic power. The possibilities of a second era of revolution as significant as the one led by Borlaug seem fairly unlikely, as today there is less agricultural biodiversity than there once was. The tepary bean is one of those ancient wild ancestors of the supermarket shelf crops we know today. It and plants like it keep hidden a wide array of genetic traits, many of which could anticipate the needs of a future crisis, depending on whether gene banks like the one at CIAT continue to be well-maintained. Only around five percent of the natural growing relatives of some of our most important crops are being properly safeguarded. While this sounds reasonable, the truth is a bit more complicated, as are the implications of maintaining. CIAT spends a million dollars annually on their electricity alone for keeping genetic material chilled. In that time, it is also constantly at risk from wars and disasters. Their sister organization is located in Syria and had to send over 80% of its collected samples abroad, preventing any damage that might occur during its civil war. A maize seed bank kept in Honduras was destroyed back in 1998 by Hurricane Mitch, and a fire destroyed a national seed bank kept by the Phillippines’ government back in January 2012. Therefore, CIAT sends off different seeds in small quantities to banks across the globe for safekeeping. Then there are those that aren’t properly safeguarded, potentially facing extinction in the decades to come, as new variations come along and climates begin to alter. CIAT’s gene bank is already 40 years old and in dire need to be upgraded to a larger facility. The organization hopes to raise $25 million for a new, publicly accessible facility that will not only properly preserve its samples, but also raise public awareness to the significance of its mission.